1) The statements in my last post about getting my first overhead, no lead time before being asked to teach a new class, and finally getting teacher editions for my texts are all true. I should let you know that I teach at a continuation high school. These schools are typically the forgotten schools in our area, sadly with students that districts consider unimportant. As a result, we are usually the lowest budgetary priority. The worst year (material-wise) was a year that they told me to teach Algebra, but did not get any books to my students for four months! So every day, I'd write problems I had created on the chalkboard and had my students copy the problems for homework. Looking back, I can understand now how some thought I must be kidding about my school situation (since I started this site as satire), but I have a serious side too - I just need to figure out how to more clearly express the difference. 2) Thanks for those who posted kind words and encouragement. I appreciate it. 3) Anonymous asked how to get in touch with me. Sorry for no link. I created this site in such haste, that there are still little problems with it. I have added a link in my profile if you'd like to send me an e-mail. I'm also on Facebook, but I'm having trouble keeping up with my Internet presence at least until I can write a few more lessons. 4) I chose the name "Nate's Nonsense" because it was both alliterative and silly. I'm open to suggestions. Anyone have a better name for this site? 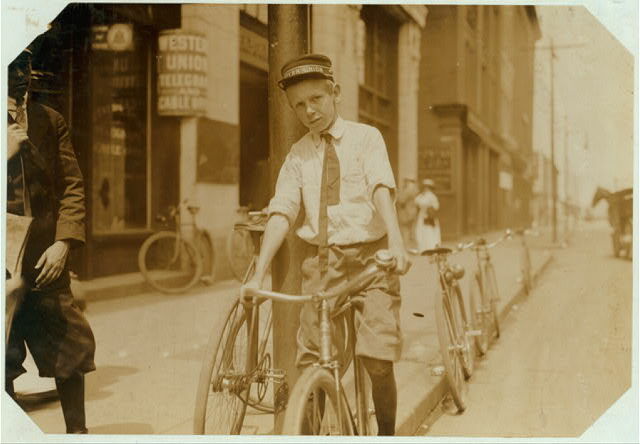 Anyway, so all this talk about communication and names, coming on the heels of dealing with my students got me thinking about a job I had as a paper boy. They don't have paper boys in our town anymore. They have grown ups who now drive through the neighborhoods in the early morning and toss papers from the window of their car. I still bump into older people in town who recognize me from when I had my paper route. They all come up and talk to me like I was a long-lost friend. The paper route was a wonderful thing for me. It was one of the easiest ways that a kid under 14 could make some good money and I think provided a greater connectedness in our neighborhood. Some make the argument that kids delivering papers on bikes or foot delayed the news. Well, most folks watched the TV News when I was a kid anyway and were prone to complain that the paper was already too slow. Now with the Internet, I don't really know anyone who reads the paper for National or World News. I find that most people read their papers for local news that they don't pull off the Internet. The interesting thing is that as newspapers have been forced to cut back, local news and reporting is one of the first cuts and the paper becomes a collection of AP feeds (all of which are stale compared to the Internet). One final note. Our local paper, when I was a kid, used to be called "The Telegram-Tribune." Everyone called it the TT. It was a merger between two 1800s papers in our town, "The Telegram" and "The Tribune." A few years ago, the paper dropped the word "Telegram" from the title. When they did so, they explained that the word Telegram was too dated and they wanted a more modern sounding name. Sounded too Grover Cleveland for them. I don't think they knew what a Tribune was. The new name sounds very Marcus Aurelius to me. If only newspapers had taken into account the shift in media. I wish there were still paper routes for kids. My son is often asking me ways to earn money. I can relate to your paper boy days. I was a bicycle riding paper boy in a small town from 4th grade through 12th. I did receive a scholarship from it-$250 plus a dollar for every week I was a paper boy. Nice money in the 50's. I have so many stories of my "paper" days that I have told my wife and kids. I worked that route around school, athletics, orchestra, and being in school plays. Those days were definitely different and in many ways better. No 100 channel TV, computer, cell phones, calculators, texting, etc., etc. Just made up your own games and events from day to day. Enjoy your blog very much. You and PJM make my mornings. Astrocrabpuff, certainly newspapers didn't consider the shift in media, only recently did our local paper start putting local news on the intro page of their website. I just don't think they realized the shift in which parts of the paper people considered worth getting from the local source. Jules, I agree. It does seem harder for my boys to get jobs, but then I just read that youth employment is at the lowest rate since 1948 (which is before my time). Anonymous. Ah, yes, those halcyon days of youth. We rode our bikes everywhere. The basic rule was you pretty much had to be home when the streetlights came on. Summer was the best though, because one could stay out after dark. Plenty of good memories of hiding in the bushes staring at a coffee can under the streetlight wondering when would be a good time to make a run for it and give it a good kick.